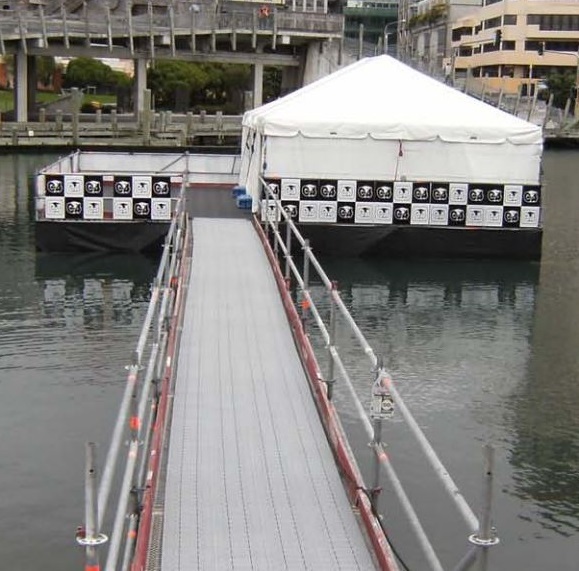 Scafit erected this 10.5m x 9m hospitality platform, complete with cantilevered diving platform, for VIP guests attending New Zealand's premierHomegrown concert on Wellington's waterfront. Apart from providing diving facilities and other liquid sustenance, the venue had autograph signing facilities for the many well-known bands attending. BJ de Wit and his scaffolding team donned goggles to erect the platform 25m out into the lagoon in water up to 3m deep. "Paua diving experience was a distinct advantage for some of our scaffolders," said BJ.